The Castell 9000, a genuinely classic pencil, was launched by Count Alexander von Faber-Castell in 1905. Over the years, the 9000's quality and finely graduated range of hardness degrees have made it a favorite of artists and illustrators. 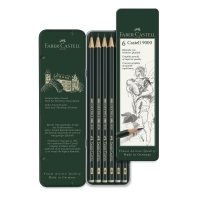 Since 1905, this top quality pencil with superior black leads, made of very finely ground graphite and clay, has been a favorite among artists, as well as for precision, technical drafting. Drawing Set of 15 — This convenient set has everything you need to draw anywhere. It includes 12 Faber-Castell 9000 pencils (8B, 7B, 6B, 5B, 4B, 3B, 2B, B, HB, F, H, and 2H), a stainless steel sharpener, a dust-free vinyl eraser, and a black nylon pencil bag. 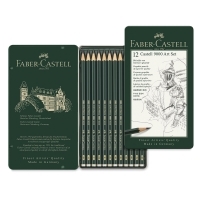 Drawing Set of 6 — This set includes one each of 8B, 6B, 4B, 2B, B, and HB. Drawing Set of 3 — This set includes one each of 2B, 4B, 6B, a latex-free eraser, and sharpener. Drawing Design Set of 12 — This set includes one each of 5H, 4H, 3H, 2H, H, F, HB, B, 2B, 3B, 4B, and 5B. 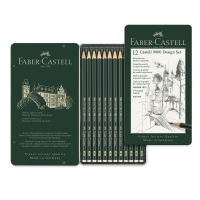 Drawing Art Set of 12 — This set includes one each of 8B, 7B, 6B, 5B, 4B, 3B, 2B, B, HB, F, H, and 2H.